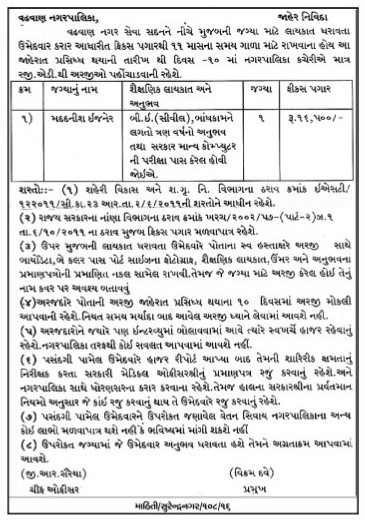 Wadhwan Nagarpalika has published a Advertisement for below mentioned Posts 2016. Other details like age limit, educational qualification, selection process, application fee and how to apply are given below. Educational Qualification : B.E. in Civil from recognized university with 3 year experience in Construction line. How to Apply: Eligible candidates may send their application & necessary documents to given address below. Address to sent Applications : Wadhwan Nagarpalika , Surendranagar.